What Parents Should Know About Instrument Deliveries During labor and delivery, it is possible a baby could get stuck on the mother’s pelvic bone and require assistance and endure an instrument delivery. Let’s face it—childbirth is not supposed to be easy. Every woman facing this momentous life event understands this and does all she can to prepare for it. Expectant mothers are grateful to have experienced professionals at their sides when they do go into labor. Whether it is a delivery nurse, nurse midwife, or obstetrician, we count on them to make the right decisions when we encounter some problem with delivery. When the decision involves the use of a delivery instrument to assist a difficult delivery, however, there is cause for concern. When a baby becomes lodged in the birth canal and the mother is unable to push any further, the delivery doctor will attempt to pull the baby out. If the doctor cannot use her hands because the baby is still too far up the birth canal, she may decide to use an instrument to help. With a delivery instrument, a doctor can reach the baby, grasp his head, and pull him the rest of the way out. The doctor may use either forceps or a vacuum extractor to aid in the delivery. Both of these devices present risks to the baby. Most babies delivered by forceps will have temporary marks on their faces, which are not a cause for concern. 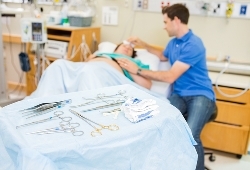 While serious injuries from forceps are rare, they can occur and should be treated immediately. Again, serious injury to the baby is not common, but the risk of injury is higher than with a normal vaginal delivery. Also, whenever a vacuum extraction is considered, a Cesarean section is usually also an option that can be considered and may pose less risk to the baby. If your baby was delivered by forceps or vacuum extraction and suffered an injury to his face, eyes, skull, or brain, call the experienced birth injury attorneys at Holton Law. We understand the risks of instrument delivery and can explain options for recovery to you.